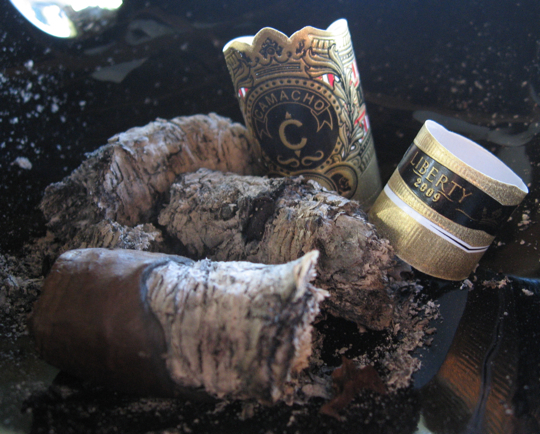 The Camacho Liberty series was started in 2002 with the idea of releasing a very limited blend. 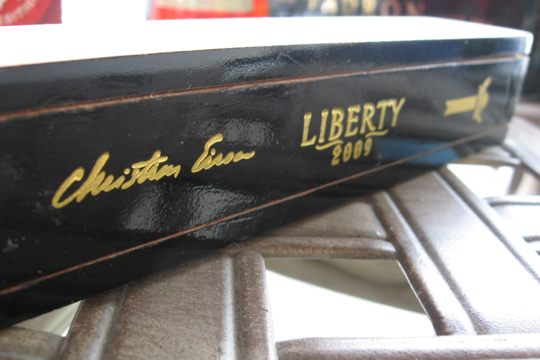 This idea was the brain child of Christian Eiroa and each of the coffin’s has his signature engraved onto the lid. 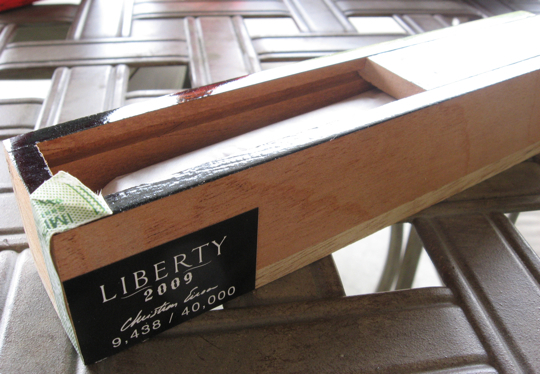 Each cigar comes wrapped in tissue paper and encased in a very nicely constructed Spanish Cedar Coffin. The coffin itself smells fantastic, as if the cedar was just cut yesterday. 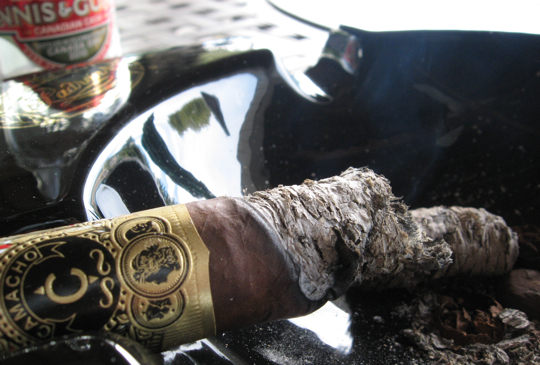 On the coffin you will also find a sticker that shows you what number of this limited production cigar you have obtained. There was a total of 40,000 produced and the box I have was numbered as 9,438. 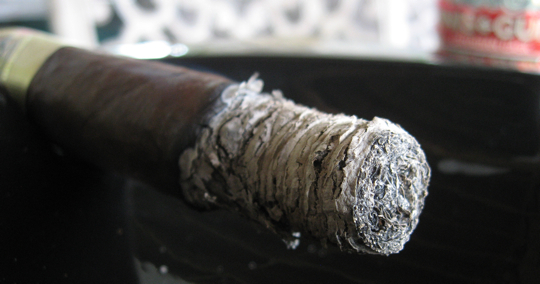 The cigar itself is made entirely from Honduran tobacco. The leaves are actually from Christian Eiroa’s farm in the Jamastran region of Honduras. 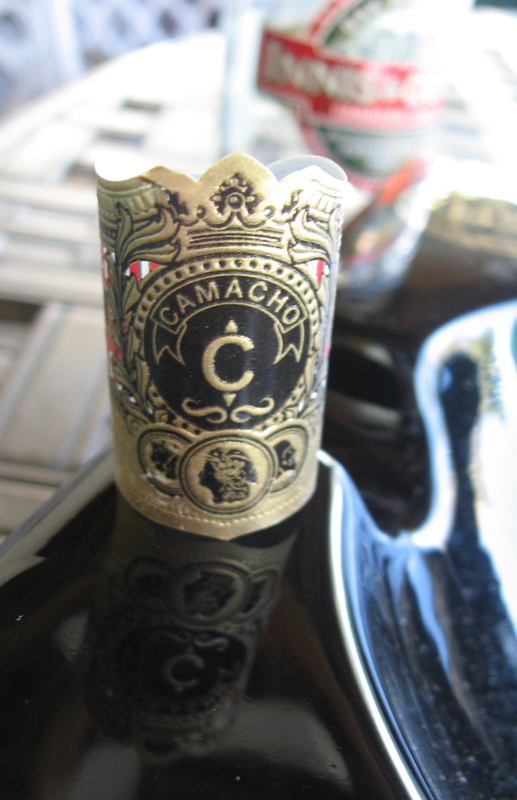 The wrapper is made up of Camacho’s single production of Habano leaf. This of course is at this time and could very well change in the near future. 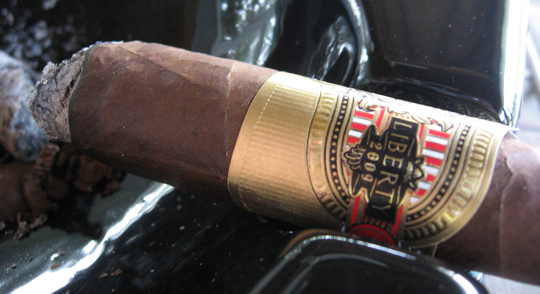 I was gifted one of these cigars and purchased a couple more for myself. I decided to light this one up with a similarly limited production beer which you can read more about at the bottom of the review in the Pairing section. 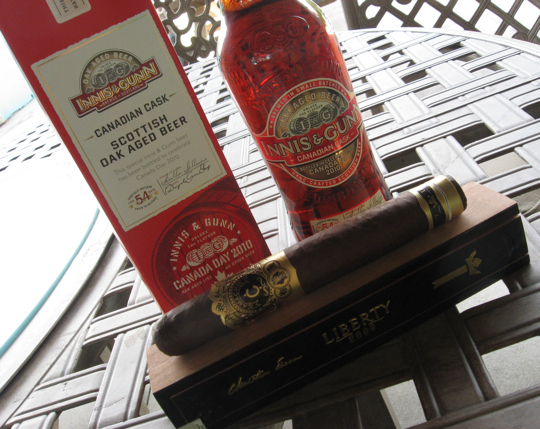 Today’s pairing comes from the Scottish Brewery of Innis & Gunn. Their Oak Aged beer is one of my favorite blondes and makes a great pairing for almost any cigar because of it’s woodsy flavors. 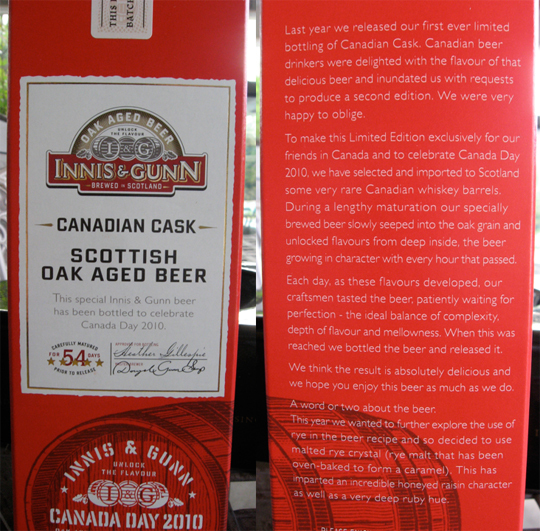 This particular batch was a limited production run called “Canadian Cask” which was produced especially for Canada Day 2010 to commemorate Canada’s birthday. This beer is aged for 54 days in Whiskey barrels and mixed with a malted rye crystal to give it an incredibly unique and flavorful experience on the palate. This is only the second year Innis and Gunn has produced this brew and I definitely hope they continue the tradition. This cigar paired well with this brew and I would definitely recommend it, they just worked so well together. Other pairings could be a nice scotch, oaky red wine, dark soda or a coffee. Here’s a picture of the box from this brew, it has a whole story about how it came to be and how it was made. I haven’t had too many Camachos either but I think I need to look into them a bit more for sure after enjoying this one. And that beer, wow was it good! The one here is a limited release for Canada only but the Innis & Gunn Oak Aged is available year round and is a great blonde! Let me know if you have a chance to give it a try. 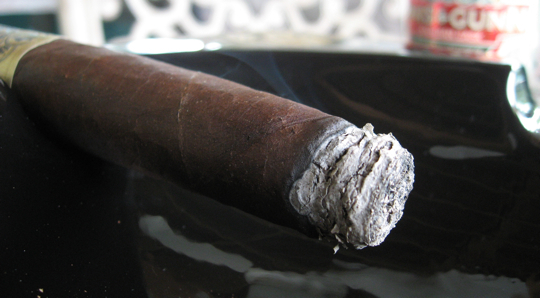 I have got to say that I have never had a Camacho before. I constantly walk by them at my local B&M. I do not understand why I never even look at them. Maybe I will need to check them out. Thanks Daniel, and I will also need to look for that beer…. Thanks for the review. 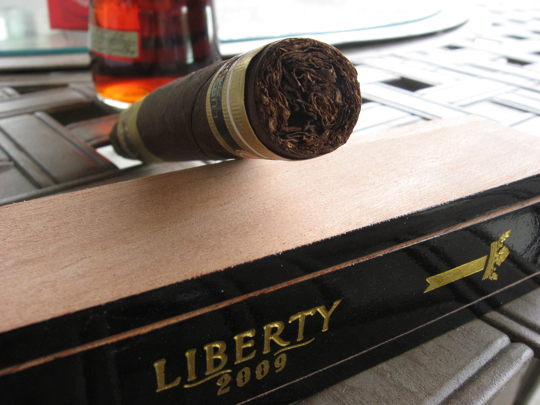 I’m not much of a Camacho fan, but I’ll have to give the Liberty a try.